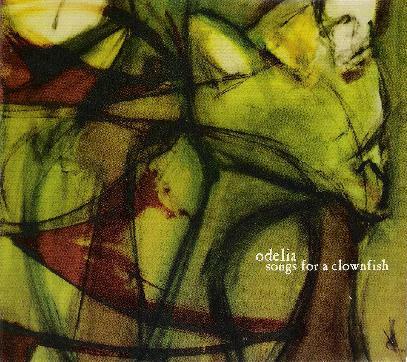 Odelia - "Songs for a Clownfish"
Odelia are a band from California and this is their third CD since 2001. They are four members who together create a very dream filled music willed with gentle rippling emotions. The music the band makes is largely improvised and composed on the spot, only taking in the feelings of the music created at the time. Most of the music is quite laid back but they have the same concept as a lot of these post rock bands and many of the songs reach a sonic peak as well. The CD begins with the 10 minute Feet That Never Heal, and this track demonstrates most all the elements you will find elsewhere on the CD. 4 Feet of Snow starts with drums straight away and some nice delay guitars as the melody builds. The music is basically guitar, bass and drums with some strange sounds (all kinds of instruments including xylophone) and things mixed into the background that occasionally bubble through the soundscape. The next track, Bicycle Prophet, sounds like it was recorded live or in a warehouse of sorts and is very raw in both its sound and the way the sound becomes more focused before the hifi sound kicks in. This track gets very intense at the end. Under the Porchlight returns to the land of dreams but has more intense drumming as the track builds up with the sound shimmering in the background. 2000 Miles of Locust is only the second song on this record to feature vocals. Tanisha begins with slowly fading in sounds and some backwards stuff as well before the organ kicks in. First time on the CD you really hear the organ clearly but this track reaches a very intense peak after which the vocals begin and the track slowly fades out. Nice. He Knew Me When I Used is one of the cooler tracks on the CD. I just like the more haunting sounds in the background that go against the melodic guitar. 12 Sleeping ends this CD. I think if you are a fan of bands like Mono and Mogwai you will dig this as well. Oh yeah, I should mention, I like the idea that the band often has a guy named John Hagan who joins them on stage, only to paint! He also did the artwork for the CD. Cool. For more information you can visit the Odelia web site at: http://www.odeliamusic.com. Visit The Gaia Project web site at: http://www.thegaiaproject.com.